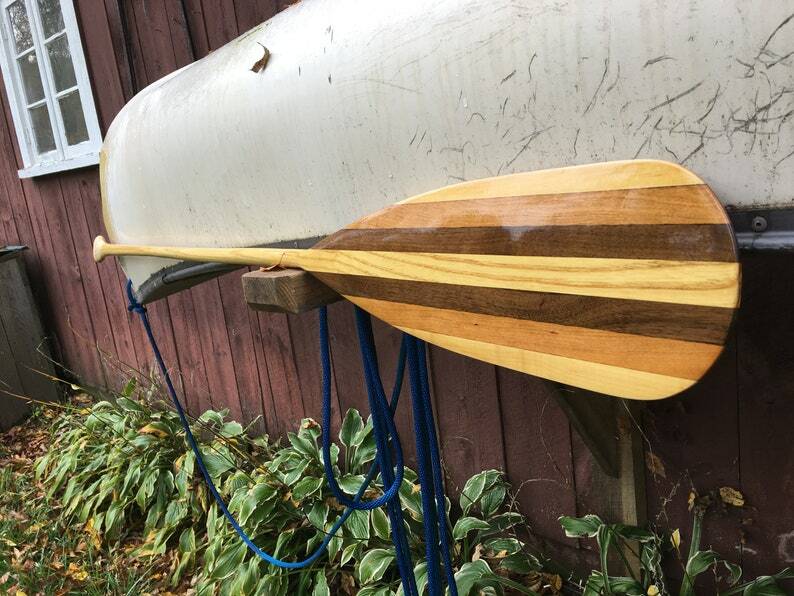 Vermont Paddle Co. crafts custom hand made paddles in the traditional styles. All VT Paddle Co. paddles are hand crafted here in Bondville, VT and come stock branded "Hand Crafted-Vermont Paddle Company." All of our wood for paddles is sustainably harvested and milled right here in VT. Custom monogramming is available to all customers at no extra charge. You will have a unique and beautiful power source for your next boating adventure! Make sure to choose your finish option when ordering. This is largely based on personal taste and how frequently you plan on using your paddle. Select oiled for a classic historic paddle feel or select varnished for a more durable marine grade varnish. Varnished paddles have a shiny durable clear coat that protects them, while natural oiled paddles have an oil finish that penetrates deep in the wood to preserve water repellent. Oiled paddles are often smoother and feel more like wood, however the finish has to be re-applied more often if you are using your paddle regularly. Hold a paddle (or a broom, or a long strait stick) above your head. Hold the paddle/stick so that your elbows make 90 degree angles with your forearm pointing towards the sky. Have a friend measure the distance between your hands on the paddle. Make sure to include this measurement once you e-mail us regarding size! We will add this length to the standard "26" beavertail blade to get your final paddle length. All of our products are crafted using found, scavenged, reclaimed or sustainably harvested wood. Your paddle is then hand carved, sanded and finished using minimal fossil fuels at Vermont Paddle Co. in Bondville, VT.